Monuments, edition of 50. Signed and numbered "Kitaj 2/50" in pencil l.l. 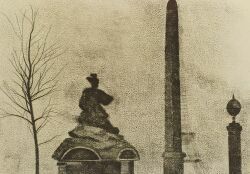 Soft ground etching on cream and white paper with watermarks "AUVERGNE..." and "326...RICHARD BAS," plate size 15 1/4 x 21 3/4 in. (38.7 x 55.2 cm), unmatted, unframed. Condition: Deckled edges, subtle handling marks and creases.